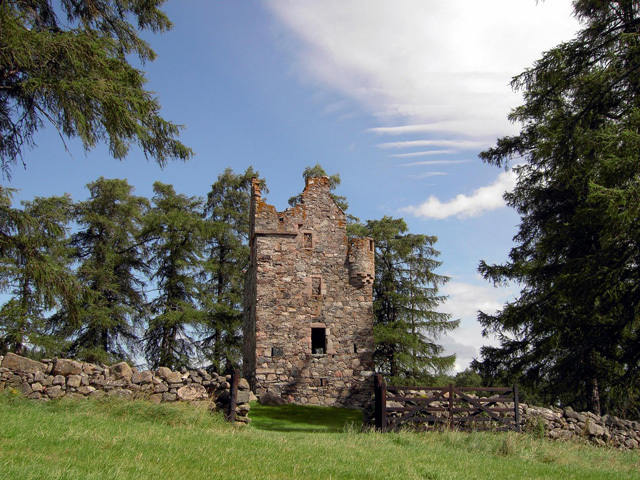 Notes: Knock Castle is a ruined tower house in Aberdeenshire, north-east Scotland. It is typical of the traditional type of residence of a laird, a Scottish landed gentleman. The Castle sits in a strong position on a knoll in a field on the south side of Craig of the Knock, at the entrance to Glen Muick. It is located about 1 mile (1.6 km) west of the town of Ballater, and about 6 miles (9.7 km) east of Balmoral, just off the A93. The castle is in the care of Historic Scotland.